OUR PRICE: $0.66 - Join Rewards Get $1 Dance Dollars On This Item! Freed 3/4" and 1/2" European pink elastic. Size: W=3/4" width, N=1/2" width. 0.5 yard long. The American movement brand is very comfortable and durable. We are always pleased with our products from Discount Dance. To be honest, the first time I bought these was because they're the cheapest ones on this site. I've also discovered that I don't even need to measure them or have scraps at the ends, as I criss-cross my elastics and cut each elastic into thirds (6"). These elastics were fine and I ordered them mainly because the price was awesome. When I sewed them, they seemed fine and continued to be fine in two out of four spots (I crisscross my elastics). The other two spots, it seemed as though every stitch pulled the elastic apart. This could have been my hurried sewing, but seeing as the other stitches were fine, maybe not. I had to resew my pair of shoes with these elastics more times than I can keep track of because my elastics just fell apart each time. They're a good color and are comfortable for me, so I recommend them, but maybe not if you like your shoes sewn prettily like I do. I like to use this elastic because it is quite comfortable, it stretches well(only a small amount is needed), and my artistic director likes the color. The only downside is that I usually reuse my elastics, but this falls apart so easily, I have to use new elastics for every pair of pointe shoes. These elastics are far too loose to offer the kind of support a dancer needs. I tried putting them on my daughter's shoes and we could both tell they just weren't going to work. They would never provide her with both the tension and flexibility she needs. Spend the extra and get some quality elastics! I know other reviews mention the distinct color of these elastics. They definitely are "pinker" than most elastics. However, I'm personally partial to the way they look and the extra "pinkness" they give pointe shoes. They look great with Freed pointe shoes, but I've also used them on my Grishkos and I think they look very nice. The elastics are slightly darker than Grishko satin, but not unattractively so. These elastics also give comfortable support and are fairly durable. I burn the ends to help keep them from fraying. As a comparison, my other favorites are Russian Pointe and Gaynor Minden elastics, which I think offer similar support but are lighter in color. I'm not one to notice anything about my pointe shoe elastics but these have captured my attention in a not so great way. The color doesn't mesh well with most shoes because it is so super pink. It stood out from the Blochs I was wearing with them, and I'm sure the would stand out incredibly on Russian Pointes because of the shoes whitish silk, I expect they would go best with Freed shoes and their extra peachy color. Also, they lacked the bounce back and support of good stretchy elastics. I would dissuade a dancer with "twisty" feet who require ankle support from these. However, because of the price and my indifference towards elastics I will probably get them again. If unlike me, you see the benefit in good elastics, I think these might be better.. I got these for my new pointe shoes and no matter how tight I sewed them in, they did not hold the heel at all. The heel of my shoe continually came off, which made it hard to dance. They might work for technique shoes if your shoes already stay decent, but I would not recommend them for pointe shoes. these elastics offer great support! I have them criss-crossed on my demi-pointe shoes and they could easily hold my shoe in place even without ribbons. My heel doesn't slip off and my arch is visible. The only thing I don't like is the color: it's way too dark. It's just like salmon. I wear Grishkos which are eauropean pink color so they don't match at all but my teacher said it's not that bad so I haven't tried dying them. I ordered this because it was cheap and convenient and I was not too happy. 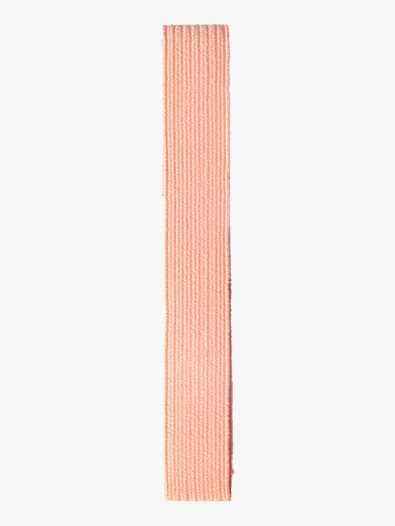 This elastic is bubblegum pink and not super durable. They break the leg line and I wear russian pointes so the color was a real eyesore. I had to run to the nearest dance store and buy new elastic. Again, not too happy with this. This elastic is strong yet flexible. Easy to get a needle through to sew on. I recommend this to all our students on Pointe. I highly recommend. 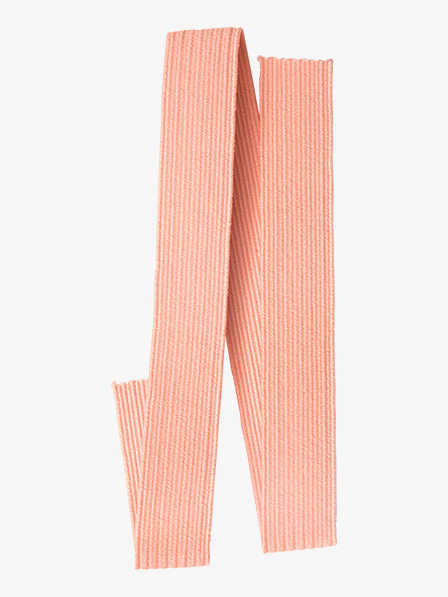 I ordered this because I have a dance recital coming up and I needed new elastic. This was the cheapest and fastest way to get some, but it arrived and I had a mini panic attack. This elastic is REALLY pink. It wouldn't have been a problem if my shoes were darker, but I have Russian Pointes and they are a very very light pink, so it does not match my shoes at all. Also, I need strong elastic to hold my shoes on my feet, as I have a shifting problem and just by stretching this elastic, I knew it wasn't going to hold my shoes on my feet. It's very stretchy. Overall, I was disappointed because now I have to go all the way to the nearest pointe shoe store to get more because unfortunately I'm out of time. This is such a great elastic. It holds well and feels very comfortable. The color might not please everyone though. Fair warning, they do not match Gaynor Mindens. But they look fine on stage as the ribbons cover most of them. Lasts long too! Just make sure you cut them in the right length, as cutting them too short may cause the edges to deform. I usually end up with enough elastic for 1 1/2 pairs of shoes per pack. (by 1 1/2 i mean 3 pieces of elastic). So worth it! i used to get the grishko ones, which are not as bright pink. i actually really like the color of. these, but they might not go well with light colored pointe shoes. they're so stretchy though!! so much stretchier than the grishko ones. they're amazing! I will definitely get these next time. If in doubt, BUY THEM! I ordered this thinking it would match our pointe shoes and the color is too dark. These are my favorite elastics. I love the color, comfort, and durability. Make sure you put nail polish on the ends before you sew them onto your pointe shoes to prevent from fraying! The elastic is nice, thin, and works well. My only problem is that the color is very dark peachy pink (like the photo). It doesn't really match any color Pointe shoe, or tights. But maybe the thin is enough to not make it to obtrusive of a color. How many shoes can you use this elastic for? I was considering getting these elastics but I don't know how much I would need for a pair. I just put elastic across my foot, it's not much. If you order this item, then it would be enough for 1 pair of point shoes.